Hi everyone! I'm here with a project for the Spooky Tags and Twine Challenge that just started over at Twine It Up! with Trendy Twine. 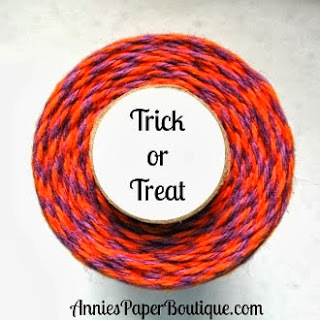 We are showcasing the fabulous Trick or Treat Trendy Twine this month. The Trick or Treat Twine makes a great topper for the tag and I also added it to the bottom by wrapping it around and tying the bow in front. I did not have to tape it down in the back this way. The stamps are from Unity and I cut out the feet and pop dotted them on. I used some Pro Markers to color, some Doodlebug pearls and a Martha Stewart edge punch on the bottom. Be sure to head over to Twine It Up! with Trendy Twine to see the other design team's projects. They made some amazing tags!! And while you are there, be sure to enter our challenge this month. We really do love to see all the projects you make. I LOVE your tag Helen!! Those witch's boots are adorable and that pattern paper such a great match to the Trick or Treat TT. This is so cute Helen, the colors look great!! Adorable witch shoes on your tag! Love the fun papers and how they coordinate perfectly with the twine! Helen, this is such a cheery tag. Just love your cute little boots and the colors look so festive. Great job!